When roasting a large mass of meat, how does the rate of heating differ between the center of the roast and portions near the edge during both cooking and resting/carryover? 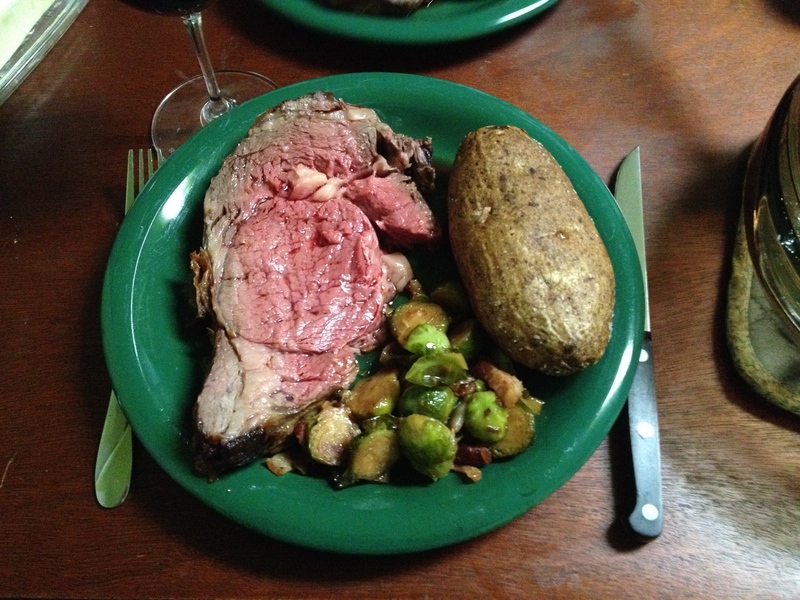 Additionally, how much mass loss is experiences while roasting a prime rib? Since roasting (as in most cooking techniques) involves applying heat from the outside, we expect that the outer portions of the roast will heat up faster, and will reach a much higher temperature than the center portion. Coat rib roast in canola oil. Salt fatty side of the rib roast. Place rib roast onto sheet pan, fatty side up (i.e. standing on the ribs). 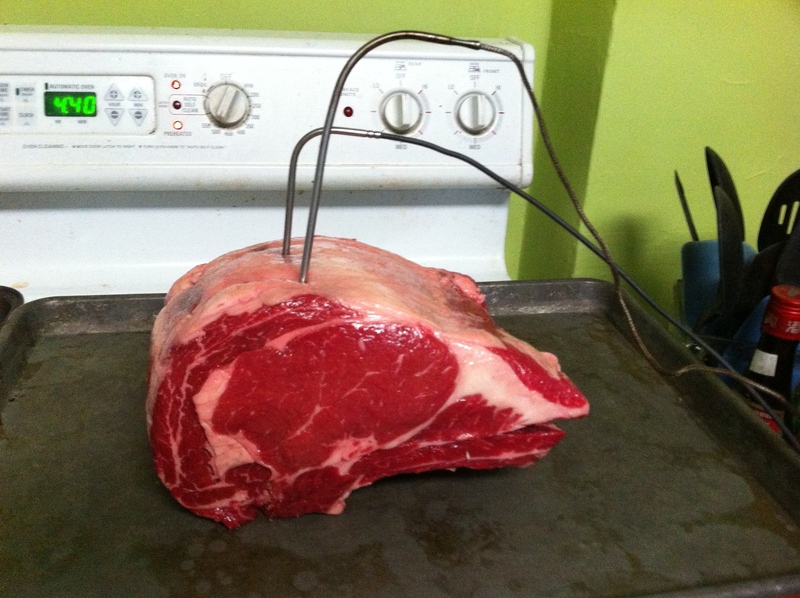 Insert one probe thermometer into the center of the rib roast from the top. Insert second probe thermometer equally deep in the roast, but about 1 inch from the end of the roast. Place rib roast and sheet pan into oven pre-heated to 500ºF for 20 minutes. Record temperature from probes periodically. After 20 minutes at 500ºF, lower the over to 350ºF. Continue cooking until central probe reaches 125ºF for medium-rare. Remove from oven and cover with foil (making sure to tear foil to get around the probes). 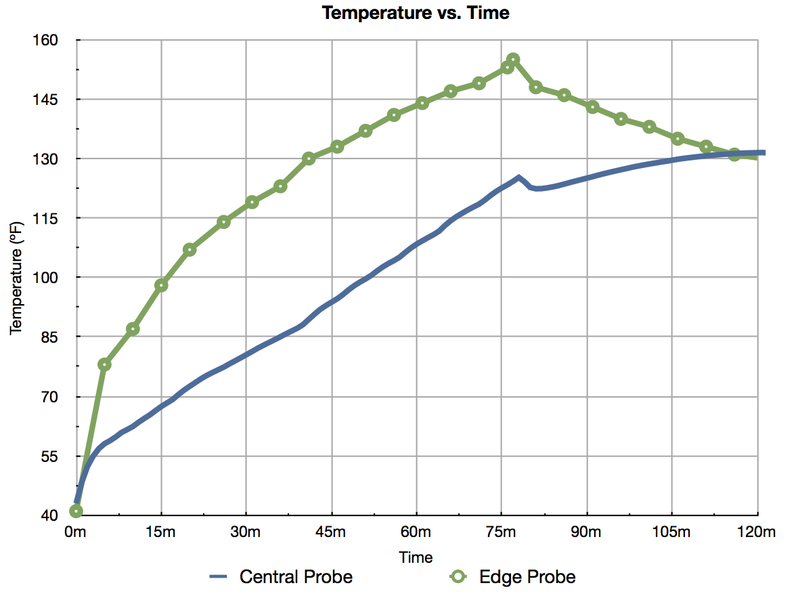 Continue recording temperatures until central temperature (first probe) stops increasing, should be around the time that the temperatures of probes 1 & 2 cross. Carve into decadent slices and enjoy with an assortment of healthy sides. Before cooking, the roast was coated in canola oil and probes were inserted as shown below (view from above). Standing rib roast coated in canola oil with both probes inserted. 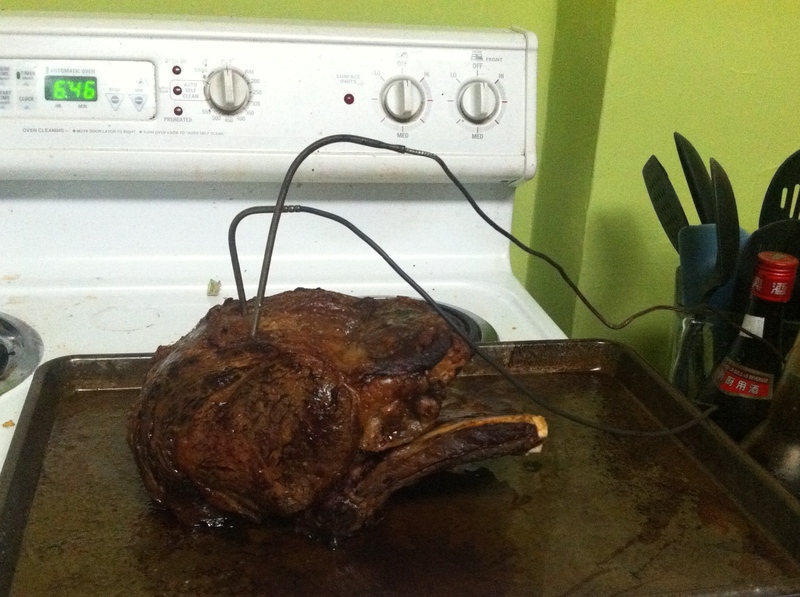 While roasting the prime rib, we recorded the temperature using two probes. The first probe placed near the center of the roast recorded the temperature automatically every half second. The one minute averages of those readings is shown in the graph below as blue. The second probe was placed closer to the edge of the roast, and its temperature was recorded approximately ever 5 minutes manually. Those values are shown in green. Temperatures recorded at the center and near the edge of a prime rib as it was roasted. In addition to recording the temperatures during the cooking/resting processes, the mass before and after cooking was recorded, as shown in the table below. After cooking, shown below, the roast had noticeably decreased in size, even causing the angle of the probes to shift. Roast after it has been fully cooked and rested. When the meat was removed from the oven to start resting, both probes recorded a rapid drop in temperature (~3-7ºF), the central probe then recorded a period of warming (carryover), while the other probe continued to cool. Our best explanation for this sudden drop, is conductive heating through the probe was causing it to read high. Once the heat source was removed, the probe started reading the actual temperature of the meat again. This would imply that most/all of the readings during cooking were several degrees higher than the actual temperature of the meat. As expected, the temperature near the edge of the roast rose much faster and reached a higher maximum temperature. It also decreased fairly rapidly during the resting phase, while the central temperature continued increasing. The resting process took approximately 45 minutes, about three times as long as we had initially planned. When sliced, the meat was a beautiful pink color (as shown below). Thick slide of prime rib (upper left), baked potato (upper right), sautéed brussel sprouts with bacon (bottom middle). Now that a baseline has been established for temperature curves and mass loss, how would things change if the meat had been frozen? What about dry aged?